Lions Club of Central Madras, District 324A1 celebrated the United Nations Day and also conducted their 45th. year Inter Collegiate Oratorical Competitions. Lion. S.Rajendran President of the club welcomed the Chief Guest, Vice Dist. Governor, young students who, their parents, Lion members and invitees. Lion Andal Rajaram introduced the Chief Guest in a very interesting way, by recalling, the gift, a small baby elephants given by Pundit Jawaharlal Nehru, to Japan. 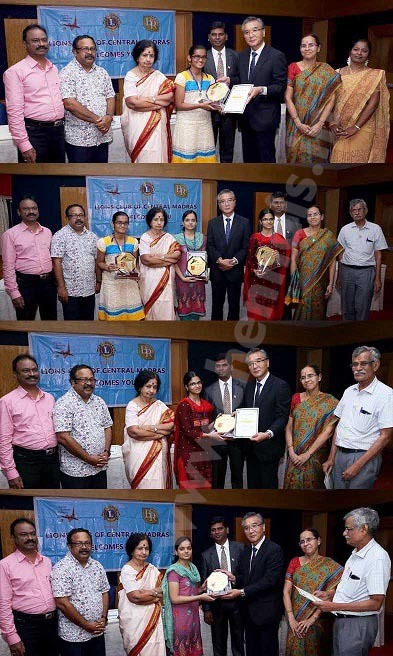 His Excellency, Seiji BABA ,Consul General -Japan was the Chief Guest. He spoke about the origin of United Nations on 24th. October 1945, with 51 countries and later on extended to 195 countries. Its objectives include maintaining international peace and security, promoting human rights, fostering social and economic development, protecting the environment, and providing humanitarian aid in cases of famine, natural disaster, and armed conflict. Japan became the member of United Nations on 18.12.1956 Coming back to the Lions movement, he lauded the humanitarian services in all fields, all over the world He also recalled, his father in law , was a Lion Member he was proud to wear the Lions Lapel Pin. He also appreciated the depth of knowledge of the young students in their chosen topics for Competition and their skill in putting their oratorical skills. His Excellency presented the Trophies, Silver Medals a book, and certificated to the first three placed students and participation certificates and books to all six participants. Ms.Vijith Nirinjana, of Meenakshi Sundararajan Engg. College, Chennai 600024, spoke on Eliminating Corruption and Role of Youth in building strong India and won the first place and the MJF Lion G.V.Raman trophy. Ms.Karthika.S. of Meenakashi Sundararajan Engg. College ,Chennai 600024 spoke on How India should plan for future policy to be Energy sufficient and won the Second Place and MJF Lion. K.Ananthachari Trophy. Ms. Annapoorani Barani of S.S.S.Nadar College of Engineering, Chennai 603110, spoke on F.D.I in Retail Market Boon or Bane? and won the third place and Lion. P. Vijaya Trophy. 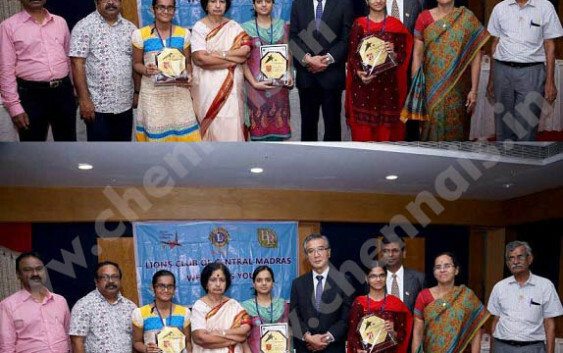 Mr. R.Govindaraj, President, Exnora Greater Chennai and Mrs. R.Meena, Headmistress, SRKM Sarada Vidyalaya, Usman Road, Chennai 600017, were the Judges. Earlier, Lion. Dr.K.S.Babai, Second Vice Dist. Governor, Dist. 324A1, told the audience about the roll played by Lions during the UN Charter Conference marking the founding of the United Nations. She further told that Lion Melvin Jones and two Past Presidents, played important roles in formulating governmental sections of the UN Charter in 1945. She proudly informed to the audience and the Consul General that Lions Clubs International is privileged to be the only Service Organization for which a specific day, March 8, with UN has been assigned. Lion. B.Ganapathy, Chairman, Oratorical competitions, coordinated with all colleges and students to get as many registrations as possible and made the competition an exciting one. Lion Arul Lazaran, Committee Chairman, U.N.Day celebrations proposed vote of thanks.